Anyone for Volleyball?The clinic team v/s the backpackers! Taking advantage of the wonderful weather in Melbourne, it was time to get out and have some fun. The beach beckoned, Emmanuel had the volleyball pumped, we were all pumped for a BIG win! 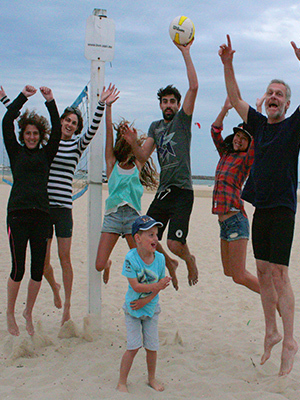 The clinic team and family members joined forces at St Kilda beach for a mix of play and relaxation along with many kite surfers, dog walkers and those not drawn to Albert Park for the Grand Prix practice sessions. The fact that some of us had never played the game and certain distractions from the kids on the sideline, did not stop our team from overcoming some stiff competition by way of a backpackers group that were looking for some opposition. Winning 2-1 in sets we came cruising through with promises of a rematch in the near future. A great game, plenty of fun, laughs with the inevitable sand filled hair, ears and shorts. Well done to us all, not least finding a weekend for us to get together, despite so many other commitments.